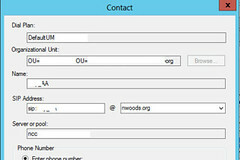 We are nearly completed in our project to move Lync from 2010 to Lync 2013. The project has gone amazingly smooth. The step by step documents and tools on the Technet Migration from Lync Server 2010 to Lync Server 2013 have proven to be a great guide. Move a handful of users to the new pool. Realize we forgot to run the Exchange ExchUCUtil for the new pool and fix voicemail for those users. Again forget to run the ExchUCUtil for the new pool and fix voicemail for those users. Our first area of heartburn was Phase 9 Step 1, Migrate Response Groups. I followed the steps, all groups moved but they didn’t work. A bit of clarification, the Workflows and Queues of the Response Groups worked fine, but calls would not alert the agents in the groups. We had to delete the groups and re-create them. With new Groups everything worked great. The second area of heartburn is the fact that Technet doesn’t include the step of moving Exchange UM Messaging Contact Objects. 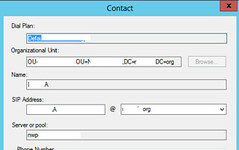 This step is in the OCS 2007 to Lync 2013 guide here, but that step is never mentioned in the Lync 2010 to Lync 2013 guide. This caused a problem for us when we started Phase 8 of the Migration Guide and started to shut down the 2010 pool. We stopped all 2010 services and then calls would ring 4 times and disconnect rather than the Auto Attendant answering. In the Lync logs we saw a 504 Server Time-Out error. And kudos to Dustin Hannifin asking a great question “Did you run UCUMUTil on the 2013 pool”… Well of course I had, but I didn’t to think to check which pool the objects were homed to… sure enough they were homed to the old 2010 pool which was powered off. So starting the Front End service on the 2010 server and one powershell command later, all Contact Objects were homed on the 2013 pool and the auto attendants were once again answering calls. Like the contact objects the technet article doesn’t mention moving unassigned telephone numbers from the 2010 pool to the 2013 pool. The steps and instructions of moving the Unassigned number can be found in the Lync Server 2013 Resource Kit Tools Documentation. After installing the Resource kit the powershell command will move the unassigned number groups from the 2010 pool to the 2013 pool. Thanks für your blogpost … I ran in those issues, caused me some headache :).